The first cutting laser worldwide of a new fiber laser generation with 4 kW laser power and only one laser module offers the possibility of cutting sophisticated materials without compromise. For the first time, stainless steel, aluminum and other materials can be processed with a cutting quality equal to that of a CO2 Laser. The VENTIS-3015AJ stands for perfect cutting results in stainless steel, aluminum and many other materials. 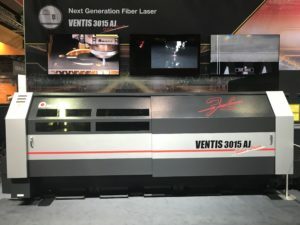 AMADA is introducing a new fiber laser cutting system with the VENTIS-3015AJ 4kW which can overcome the current limitations of fiber laser technology using a revolutionary flexible beam guiding system. With only 4 kW laser power, the system is able to perform to a level that is usually only achieved by 6 or 8 kW systems. The use of an innovative process means that the system is able to oscillate the laser beam in the kerf based on predefined patterns. This not only results in a significantly increased cutting speed, it also guarantees an absolutely precise bevel free cut. The surface roughness achieved in the fiber laser field is unequaled and is only comparable to the quality of a CO2 laser. At the same time, the so called fiber laser burr which is otherwise usual can be almost completely excluded. Flawless and consistent quality is a particularly decisive factor for demanding clients. AMADA VENTIS-3015AJ is the solution for this task due to a continuously maintained laser mode. As a result, the AMADA VENTIS-3015AJ achieves unusually high-quality results for a 4kW fiber laser. The beam parameter product (BPP) is maintained consistently at BPP ≤ 0,9 mm*mrad. Due to the diverse oscillating patterns of the laser beam, each task can be approached individually; thin as well as thick metal sheets can be cut at its individual maximum speed and with equally high-quality precision. In addition to its high capacity for performance, AMADA VENTIS-3015AJ also offers a high level of resource sustainability. The significantly higher processing speed provides an additional saving in costs for each manufactured part, because the required power and cutting gas can be further reduced to a significant extent. Special feature The laser beam oscillates in the kerf based on flexible patterns.